Valeriana officinalis L.It is a perennial herb of the family Valerianaceae, 50-150 cm (20-60”) tall with short thick rhizome with numerous brownish-yellow roots. Stem is erect, hollow, cylindrical, grooved, at the bottom it is purple almost to a half. The leaves are pinnate, opposite, root, on long petioles, upper are sessile. The flowers are pale pink or pale violet, fragrant, clustered in semiumbels at the tips of stems and lateral branches. It grows in the meadows, forest edges, in lower places. The soil does not matter. It grows often near swamps and rivers. It flowers in July and August. The flowers produce nectar, but since there is a lot of honey plants blooming in that time, the bees are not particularly active in visiting this plant. From one plant the bees produce 0.0137 g of honey. Honey productivity is 20-100 kg per 1 ha. It is used as a sedative for nervous agitation, insomnia, nervousness of cardiovascular system, spasms of the gastrointestinal tract, widely used in mild forms of neurasthenia and psychasthenia, menopausal disorders and certain diseases of the liver and biliary tract . Often pit is used with other sedatives, heart and antispasmodic. 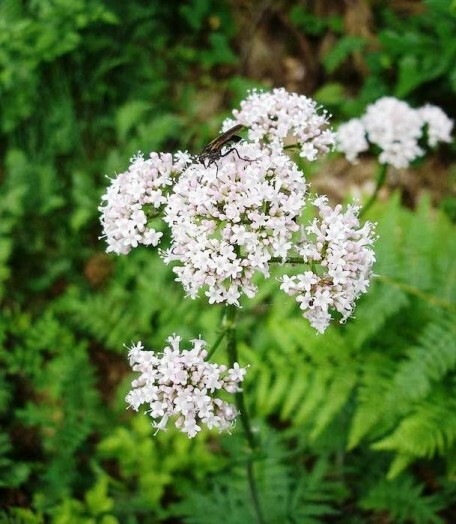 In folk medicine, Valeriana tincture is used for headaches and inflammation of the sciatic nerve (sciatica). 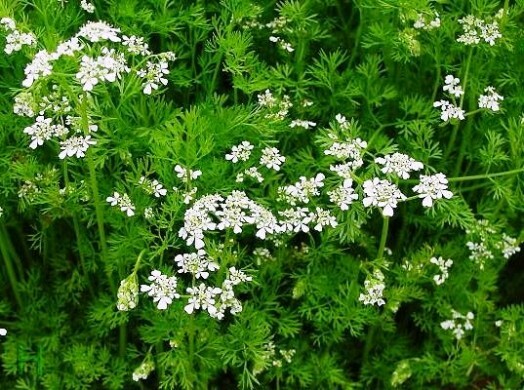 Valeriana is an effective medicine in case of high activity of the thyroid gland. Prolonged use and overdose can lead to drowsiness, depression, decreased efficiency. These side effects disappear quickly when you stop taking Valeriana. Oregano – Origanum vulgare L. It is a perennial herbaceous essential oil and honey plant of the family Labiatae, 30-60 cm (15-30”) tall with an oblique rhizome. Stems are erect, four-sided, reddish, branched at the top, soft-hairy. Leaves are petiolate, opposite, oblong-ovate, entire. The flowers are small light purple or lilac-pink, two-lipped in the sinuses of dark red bracts, are collected in corymbose paniculate inflorescence. The whole plant is covered with hairs, very fragrant. The fruit splits into four rounded brown nuts. It grows in full sun, in dry, sandy soils, among bushes, forest edges. It blooms from July until the first frost. Flowers secrete nectar, are actively visited by bees. 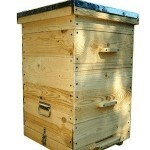 Honey productivity from 1 ha is 80 kg. Honey is flavored, has amber color with a greenish tinge. Oregano contains quite a large amount of selenium, which prevents and slows the aging of cells. Oregano stimulates appetite, the activity of the intestines, improves digestion, relieves spasms of the stomach and intestines, relieves nausea, vomiting and headache, increases menstrual bleeding and has a diaphoretic, diuretic, cholagogue, expectorant, analgesic, sedative, anti-inflammatory, antiseptic and wound healing properties . Infusion of oregano is taken in case of colds, coughs, asthma, pulmonary tuberculosis with sputum and other respiratory diseases, diseases of the stomach and intestines, to regulate menstruation when there is a delay. Oregano is used as a mild sedative and sleep aid, is used in case of a bad mood and even mental confusion. The infusion is also recommended to use in case of the absence of appetite and as an aid to improve digestion in case of a lack of stomach acid and gastric atony. The infusion calms overexcited sexual organs. 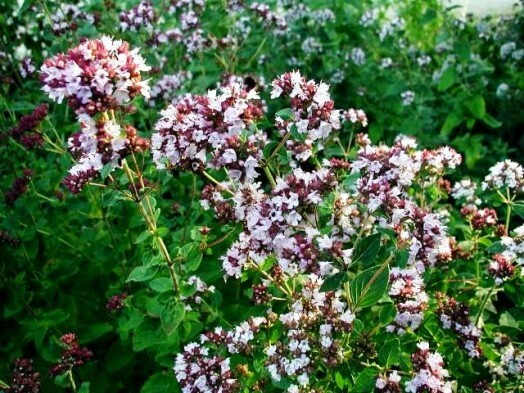 Outwardly oregano is used in the form of baths, wash, lotions and wet compresses in case of rickets, scrofula, itchy rashes, abscesses, boils and other skin diseases. Infusion of oregano can not be used during pregnancy. 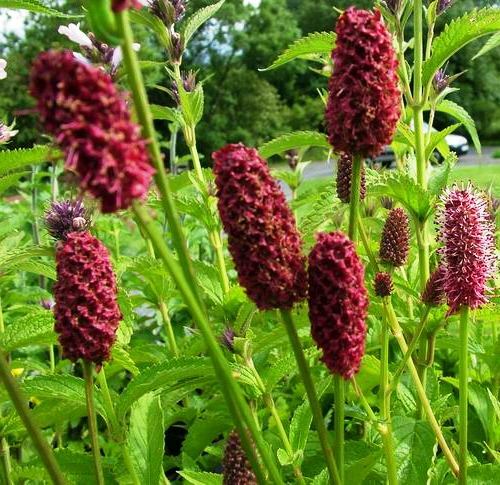 Burnet drug – Sanguisorba officinalis L. It is a perennial herb of the family Rosaceae with the height of 20 – 80 cm (8-30”). Stem is mostly solitary, slightly branching in the upper part , hollow, glabrous, erect, up to 1 meter (40”). Root leaves are large, pinnate, with 7-25 toothed blue-gray from the bottom leaves, upper leaves are smaller, sessile. The flowers are small, dark, almost black-purple, assembled in oval, 1-3 cm (1”) long heads on long stalks. At the edge of the concave receptacle there is glandular disc, secreting nectar. Fruit is achene. It does not grow in its natural state. Burnet can be grown in gardens, orchards or in home gardens. It flowers in July – August. Bees actively collect pollen from the flowers and nectar. Decoction of the roots and rhizomes and grass infusion stop active bleeding (uterine, gastrointestinal, pulmonary, hemorrhoids, etc. ), narrowing the blood vessels, slowing peristalsis, stop seizures, relax and stop inflammation and have astringent, soothing and strong bactericidal effect. Volatile roots kill germs of typhoid and paratyphoid group for 15 minutes, and dysenteric group – after 5 minutes. Decoction of the roots helps in case of dysentery and diarrhea. Outwardly decoction of rhizomes and roots is used in the form of wet compresses for various inflammatory processes of the skin and as a rinse in case of the inflammatory processes of the mouth and throat. Grass infusion or decoction of rhizomes and roots are used for the seating ten-minutes baths in case of external hemorrhoids. Coriander seed – Coriandrum sativum L.It is an annual plant of Celery family (Apiaceae). It flowers in June, July and August, depending on the time of sowing. Petals are white or pale pink, clustered in an umbrella. The flowers produce nectar and are actively visited by bees. 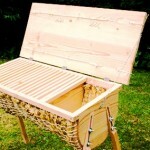 Honey productivity is 60-120 kg per 1 ha, in favorable weather – 200-500 kg per 1 ha. Its seeds contain up to 15% essential oil, which is used in perfumery. Coriander is sown at different times in order to prolong the period of honey flow. Seed rate is 1.5-2 g of seeds per 1 m2. 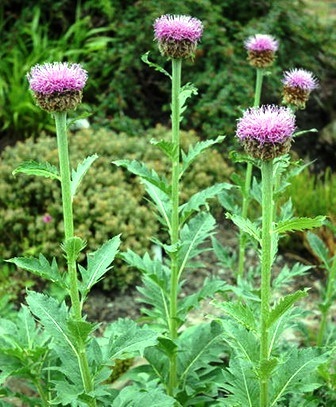 Maral root (Rhaponticum carthamoides) – (Willd.) Iljin.It is a rhizome perennial herbaceous plant of aster family (Asteraceae) in height 100-180 cm (40-70”). Underground plant organs have a specific smell, composed of dark brown horizontal branching rhizomes with numerous thin, coarse roots up to 20 cm (8”). Rhizome forms from 5 to 20 vegetative shoots, with a rosette of 3-4 large, stemmed leaves, 60-100 cm (30-40”) long, 6-21 cm (2-8”) wide. Leaves are pinnately. 1-2 generative shoots have hollow, ribbed or almost naked stems 100-150 cm (40-60”) tall, with a small sessile leaves. Baskets are apical, single, with a diameter of 4-8 cm (2-4”). Tubular flowers are bisexual, pentamerous, violet-pink. Seeds are elliptical, gray-brown, ribbed, 6-8 mm (0.4”) long, 3-4 mm (0.2”) wide, with a short fringed edges. It is propagated by seeds and vegetatively, but vegetative propagation is predominant. In its natural state it grows in the alpine and subalpine meadows. This plant is frost-resistant. It blooms in June. The seeds ripen in August. Flowering lasts 15 – 20 days. Bees take nectar and pollen from the flowers. Honey productivity depends on the meteorological conditions and is 83-120 kg per 1 ha. The roots and leaves of this plant are well known in folk medicine. By its action maral root is similar to ginseng. It is used as a tonic for fatigue and loss of strength. Liquid extract and tincture of the root are used in medicine as a stimulant in case of functional disorders of the nervous system, mental and physical fatigue, reduced work capacity, impotence, chronic alcoholism. Contraindications to the use are not established, there are no side effects and cumulative properties. Melissa (lemon mint) – Melissa officinalis L. It is a herbaceous perennial rhizome essential plant of Lamiaceae family with a height of 45-90 cm (15-35”), with a pleasant lemon scent that attracts bees. Stems are quadrangular, branched. The leaves are opposite, ovate, crenate-serrate, pubescent. Flowers are irregular, two-lipped, white. Calyx is campanulate.There are four stamens, pistil with upper ovary and long style. The fruit consists of four small egg-shaped nuts, enclosed in a cup. 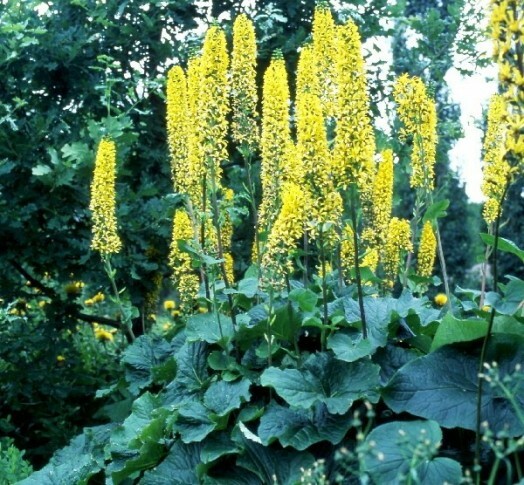 It grows among shrubs, forest edges, on wastes. 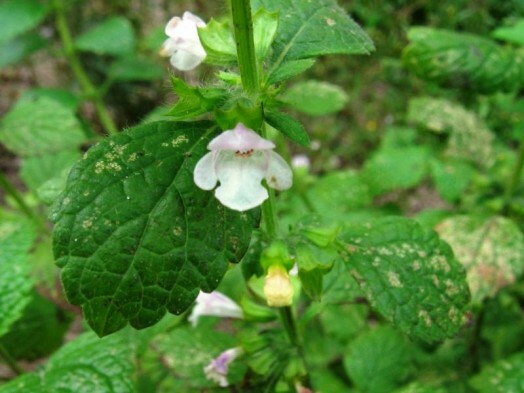 It is cultivated in plantations of medicinal and essential oil plants. It flowers for 30-40 days. The flowers secrete nectar well. Honey productivity is 130 – 200 kg. Melissa enhances appetite, the activity of the digestive organs, has a mild laxative and diaphoretic action, stops nausea and vomiting, breaks wind in stomach and intestines, stops spasms, reduces and eliminates pain, has a positive effect on the heart, calms and strengthens the nervous system. The plant also regulates sexual activity, has a calming effect during overexcitation of sexual function, reduces pain in the heart, stops shortness of breath, the attacks of tachycardia, helps in case of decreased blood pressure, slows heart rate and breathing. Outwardly leaf infusion or tincture of shoot tips are used as a rinse for toothache and gum disease, as well as herbal pillow-packs in case of rheumatism, bruises and sores. Due to the fact that the plant is very fragrant, people rub the hives to attract swarms, as well as hands before working with the families of bees. Borage – Borago officinalis L. It is an annual honey plant of Borage family (Boraginaceae), 40-90 cm (15-30”) tall. Stem is branched, covered with stiff hairs. The lower leaves are ovate-oblong, petiolate, wrinkled, upper – oblong-lanceolate, sessile. It smells like fresh cucumbers. It has pinkish buds. The flowers are beautiful, blue, drooping, small, with 5-petal, conjoined, rotate corolla, gathered in curls. It grows wild as a weed in gardens, vegetable gardens, in landfills, cultivated on plantations. 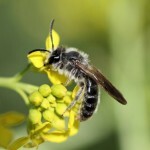 It flowers from June until frost and secretes nectar and pollen very ample. 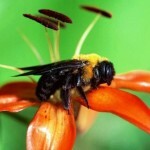 Bees actively visit the plant, even during small drizzle. Honey collection is very high. From 1 ha of plants you can get 230-300 kg of honey. In favorable weather it increases up to 850 kg per 1 ha of continuous thickets. Seeds, sown in late April – early May, bloom in the second half of June, after about 40 days, and give the bees honey until the autumn. 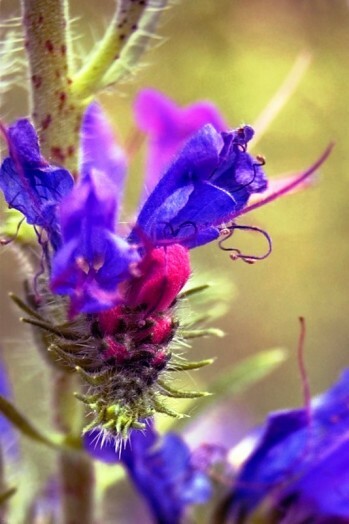 Borage is hygrophilous and grows well on fertile soil, forming many flowering shoots. It can be trimmed, as it forms new shoots and flowers. 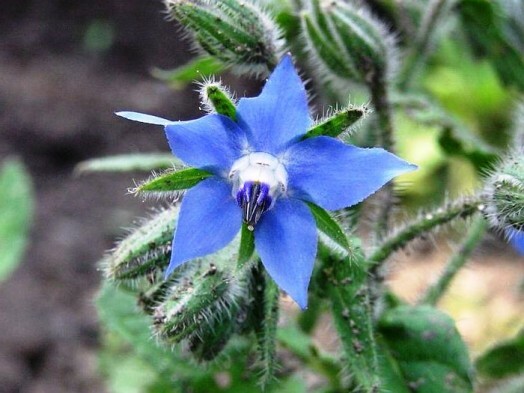 Borage increases secretion of urine and sweat, stops rheumatic pain, reduces the intensity of the inflammatory process, regulates the activity of the heart, strengthens the nervous system, improves metabolism in case of various skin diseases. Borage has demulcent, enveloping effect, moderating irritation. Infusion of herb is used in case of the weak activity of the heart and heart neurosis, various nervous disorders, rheumatic and other pains, muscular rheumatism, inflammation of the kidney, fever and skin diseases. The infusion is used as a laxative, diaphoretic, emollient, coating and anti-inflammatory. Borage is eaten in a salad. Ordinary bruise – Echium vulgare L.It is a biennial plant of the family Boraginaceae, 30-90 cm (10-30”) tall, stem is erect, height is 30-50 cm (10-20”), sometimes 90 cm (30”), whole plant is covered with hairs. The leaves are lanceolate, 5-10 cm (2-4”) long, leaves are sessile, linear-lanceolate. The flowers are beautiful, small, funnel-shaped, bright blue (with pink buds), gathered in curls, and then in paniculate inflorescences. Fruits are brownish nuts. It grows as a weed between cultivated plants. In the wild it grows in the raw and waste places. It blooms from June to September. Flowers abundantly secrete nectar and pollen and are actively visited by bees. From one hectare you can get 250-300 kg of honey. Honey has very high quality, light amber color and has an excellent taste and does not crystallize. Bruise has a calming effect on the nervous system, reduces cramps, causes coughing up of phlegm and has antitoxic action. 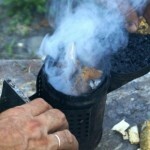 Infusion of the herb is used in case of the “falling sickness” (epilepsy) and bites of poisonous snakes. In scientific medicine infusion of the herb is used as an expectorant and sedative for coughs, especially whooping cough. Internal use of ordinary bruise requires great care. Phacelia – Phacelia Juss. The most common is Phacelia tanacetifolia Benth. – an annual herb of the family Hydrophyllaceae. The first blue flowers appear in 30-40 days after sowing. 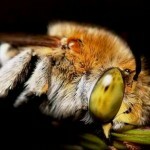 Bees actively take the nectar and pollen. Honey harvest is 120-500 kg per 1 ha. Honey is a light green or amber, has a pleasant aroma and delicate flavor.